Few powerful kings or beautiful women were ever painted by as many great artists as the poet Guillaume Apollinaire. 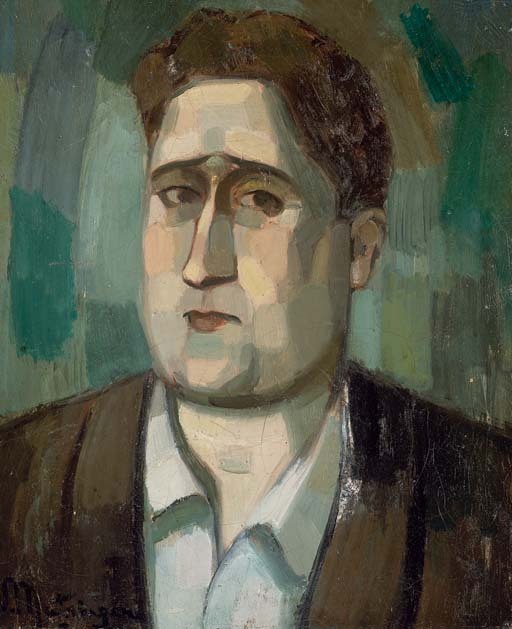 His distinctive square head, with its prominent jaw, was painted by, among others, Juan Gris, Pablo Picasso, Henri Rousseau, Marie Laurencin, Henri Matisse, Marc Chagall, Louis Marcoussis, Francis Picabia, Robert Delaunay, Jean Metzinger, Marcel Duchamp, Giorgio de Chirico, Mikhail Larionov, and Maurice de Vlaminck. Poster from the Apollinaire, the Vision of a Poet exhibition at the Musée de l'Orangerie, Paris, based on a 1914 portrait by Giorgio de Chirico. 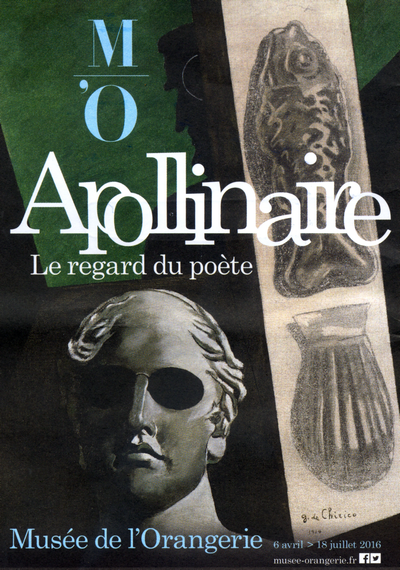 Apollinaire was of course not only a poet, but also an art critic - one of the greatest in the history of modern art. He was the leading critic in Paris from 1902 until his premature death in 1918, and was a central figure in the transformation of the art world, at a time when a change in the structure of the art market ushered in a new era of rapid innovation. The Impressionists had initiated this change in the 1870s and '80s, as their group shows had effectively ended the monopoly of the state-sponsored Salon in determining which artists would become successful. The talented and ambitious Spaniard Pablo Picasso then advanced the change by becoming successful while exhibiting his art exclusively at private galleries, making group shows, and their judges, anachronistic. Conspicuous innovation now replaced juries' stamps of approval as the art world's currency, and critics played a key role in explaining these often radical changes to a new generation of collectors. Portrait of Apollinaire by Jean Metzinger (1910). Image courtesy Musée de l'Orangerie, Paris. Apollinaire was the most important of these critics. He quickly understood that rapid change would be the new steady state of the art world, and he consistently embraced novelty, famously declaring that you couldn't carry your father's corpse around with you. He invented the term Surrealism, later seized upon by his friend André Breton, and he promoted the work of the bizarre playwright Alfred Jarry, who would be the inspiration for the Theater of the Absurd. Apollinaire's taste was discerning, as he repeatedly identified the best new painters, and the most important new movements. He wrote the first book about Cubism, the greatest movement of his time, and gave his highest praise to Pablo Picasso, the greatest member of that group. 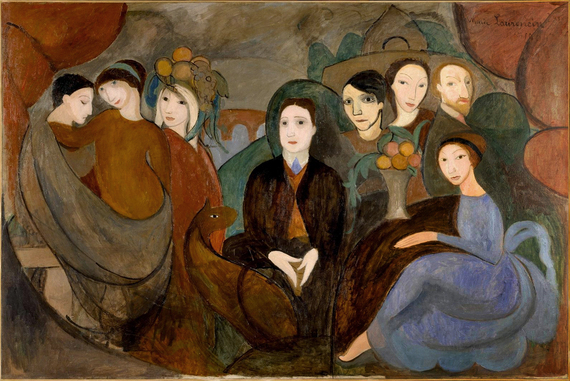 Marie Laurencin, Réunion à la campagne (Apollinaire et ses amis) (1909). Apollinaire did something that few critics have achieved, by actively influencing the course of artistic change. Gino Severini recorded an instance of this in his memoirs, as he described how Apollinaire's verbal account of Picasso's new invention of collage allowed Severini to begin using the device successfully, and in turn to pass it on to his Futurist friends in Italy. Like Baudelaire before him, Apollonaire was a conceptual critic for an art world that was becoming ever more dominated by ideas. Picasso, Reading the Letter (1921). 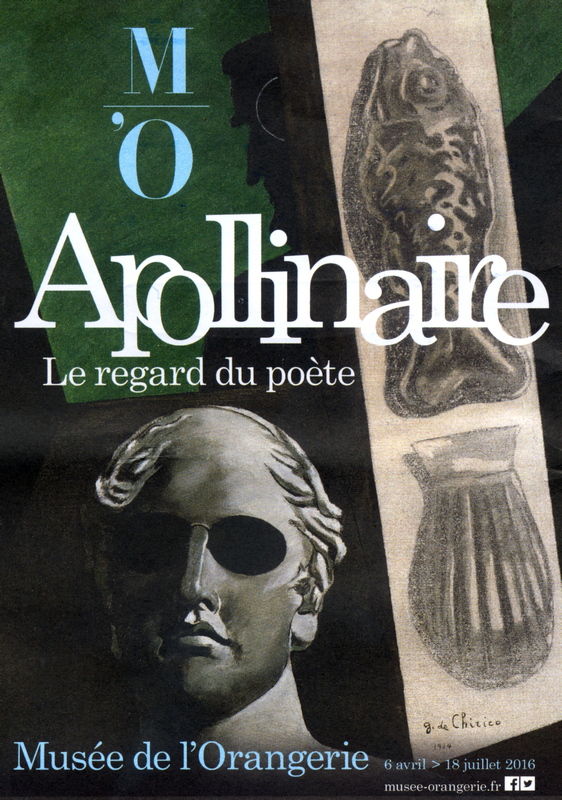 Apollinaire was a close friend of scores of artists. His strongest relationship may have been with Picasso: the two were witnesses at each other's weddings, often went to the theater together, and spent many evenings in cafés discussing art. 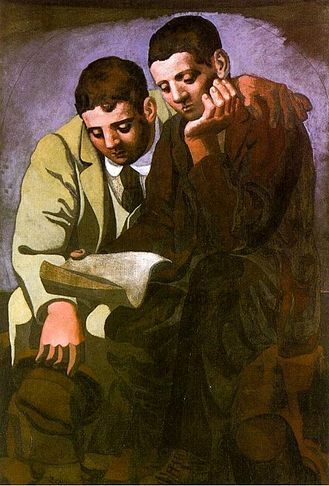 Picasso never stopped thinking about his old friend: in 1921, he painted a touching portrait of himself and Apollinaire completely absorbed in reading a letter together, with Apollinaire's arm draped around Picasso's shoulders, and in 1948, on the 30th anniversary of Apollinaire's death, Picasso drew a portrait of the poet crowned with a wreath of laurel leaves. 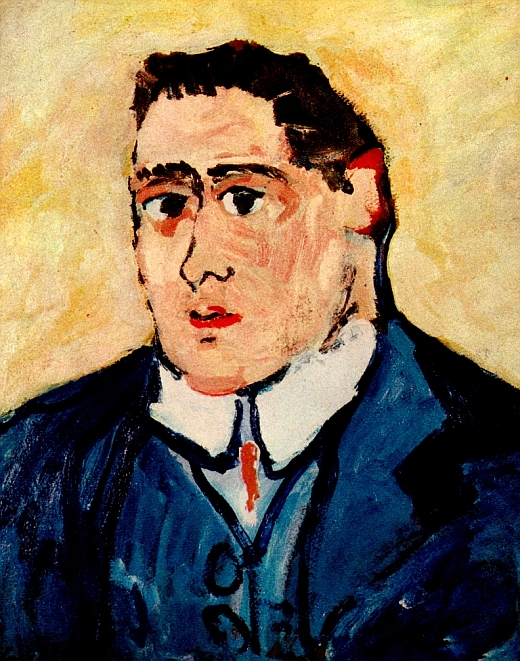 Portrait of Apollinaire by Maurice de Vlaminck (1903). Image courtesy of Le Musée de Morlaix, Morlaix, France. In tribute to Monet's panoramic murals of water lilies, the painter André Masson called Paris' Orangerie the Sistine Chapel of Impressionism. For the next few months, this beautiful exhibition in honor of Guillaume Apollinaire also makes the Orangerie home to a vivid portrait of a seminal moment in the early history of modern art.